Alpbach can get under your skin. The first time we went i summer it was Pfifferling season. Heaven for fungus lovers. Several restaurants in the Austrian village were offering the little trumpet shaped forest mushrooms, which are better known in Britain by their French name, chanterelles, in a variety of dishes. One had constructed an entire main course menu based on them. I ate them instead of meat, in a ragout. At the Jakobswirt they were served as a piquant goulasch, with a dumpling. And in the most delicious creation of all, the chef at the Gasthof Post combined them with tagliatelle and air dried beef in a cream sauce. It should have come as little surprise that we did not spot any in the woods. When we asked her where they grew the lady who brought us beer at the end of a hot day's hiking replied: “You have to know the places”. The hint of mystery in her voice evoked visions of furtive fungus gatherers, sneaking out at dawn, glancing over their shoulders lest anyone should be tailing them in the hope of discovering their secret, tree shaded sources. In an increasingly homogenous Europe it is always encouraging to find something to eat or drink which is not widely available at home. After dinner one night were were offered a complimentary Obstler, or schnapps. Not just any old Schnapps, but one made in nearby Reith, the waitress informed with some pride, by a farmer who grew his own apples and pears. And we were delighted to discover that some local restaurants still offered an even more exotic Tirolean speciality, Graukase. So called because of the grey patches allowed to form in it, this otherwise white, crumbly cheese is traditionally served with oil, vinegar and onions, and is something of an acquired taste. 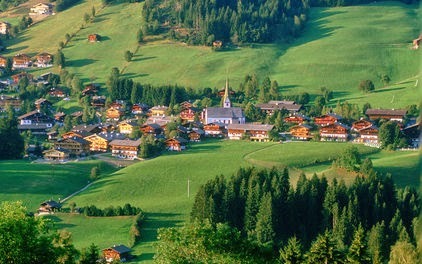 Some years ago Alpbach was voted the most beautiful village in Austria, an accolade worth its weight in truffles, not least because it stuck in the mind. Whether it really is the prettiest is a matter of opinion, or course, but it is unarguably photogenic. Most of its buildings are in traditional style. In summer their wooden balconies spill a forth of geraniums and petunias. At its heart is a green spired church, with a baroque interior, clearly designed to be large enough for a solidly devout population. Alpbach evidently has solid devotees abroad. At the top of a meadow above the village is a small plantation of young trees, each planted in honour of a tourist who has visited forty times or more. There are several British names among them. On a quiet road about Inneralpbach, a smaller, satellite village, we stopped by a wooden seat bearing a plaque in memory of another Briton, who loved this valley. You would be right to infer from this that the village, in summer at least, is not an ideal choice for clubbers. Though there are plenty of families - back carriers can be rented by those who want to take very young children out hiking – visitors are mostly of more mature vintage. The one bar obviously aimed at a younger clientele, its facade lit by garish neon, looks absurdly out of keeping. On that first holiday we rented a beautifully furnished and equipped first floor apartment on the edge of the village. Each day the baker delivered fresh breakfast and picnic rolls which we had ordered by leaving a ticked form and a bag outside our door the previous evening. As well as the familiar, plain white variety, we could opt for rolls with sunflower, sesame, or poppy seeds, for example. There are few places in which it is better to go walking than the Alps when the weather is fine. Rarely was it cool enough to start climbing directly from the village. 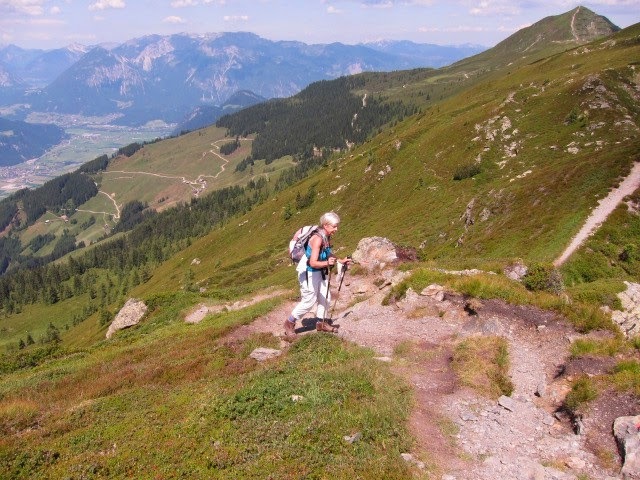 Then we laboured up to the Schatzberg, taking around four hours to reach the summit and pausing on a restaurant terrace to eat strawberry cake and slake thirsts with half litres of chilled elderflower (Hollunder in German) cordial. An accordion player and harpist struck up a tune and a couple got up to dance, he in a green, Tyrolean felt hat, performing delicate little steps in hiking boots. Most mornings, however, the July heat encouraged us to gain altitude before setting off. This was possible by catching a ski gondola to from Inneralpbach or, when that was not operating, from a lift station a little way down the valley. Both lifts deposit you just below the Wiedersberghorn, from which there are a number of walking options. One is to climb to the summit at 2127 metres and descend steeply on the far side to a hut which serves food and drinks. 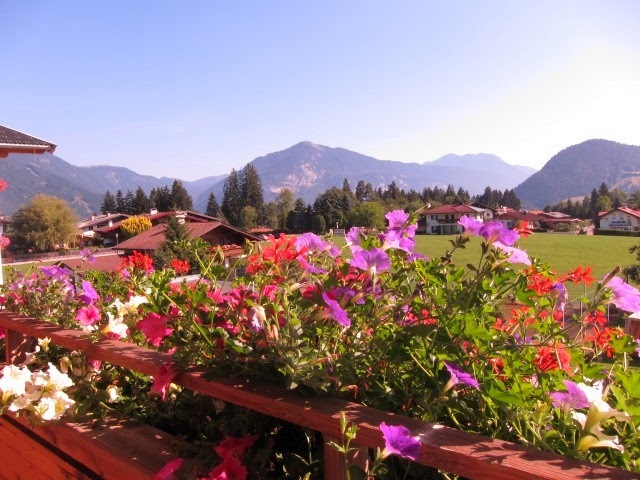 The other is arrive at the same point by skirting the peak on an easy path called the Panoramaweg, contouring along slopes covered in pink Alpenrose. From the hut a magnificent ridge walk ran to the foot of the Standkofp or, for those making an early start, the Hamberg. On a clear day the views are sumptuous. In one direction across the Inn Valley, southern tip of the Achensee was visible, white sails flecking the blue surface of the lake. In the other, beyond the Ziller valley, was the white expanse of the Hintertux glacier. Our Kompass walking map of the region showed the ridge path as “partly for experienced climbers” - yet another example of how difficult it can be to classify a route. There may be more daunting terrain beyond he Standkopf peak, which was as far as we got, but the section we covered should pose no difficulty for any hiker with a moderately good head for heights. As holidays are supposed to be a break from routine it is odd how quickly holidaymakers develop routines. Days always ended in the same way: drinking a long anticipated beer under a sunshade; switching to chilled white wine on the apartment balcony and watching evening shadows slant on glossy green meadows across the valley; finding a table on a restaurant terrace for dinner, if not of mushrooms then Wiener Schnitzel perhaps, or venison. Late each afternoon we found a spring from which to top ump our water containers. In Tyrol these springs have been developed into an art form. Most commonly the water bubbles up a felled section of tree trunk and out through a short branch into a trough. By one, a decorated glass mug had been left, secured by a chain. By another was a right angled bench seat where weary groups could sit and refresh. As must be obvious by now, we have returned several times, in winter as well as summer. 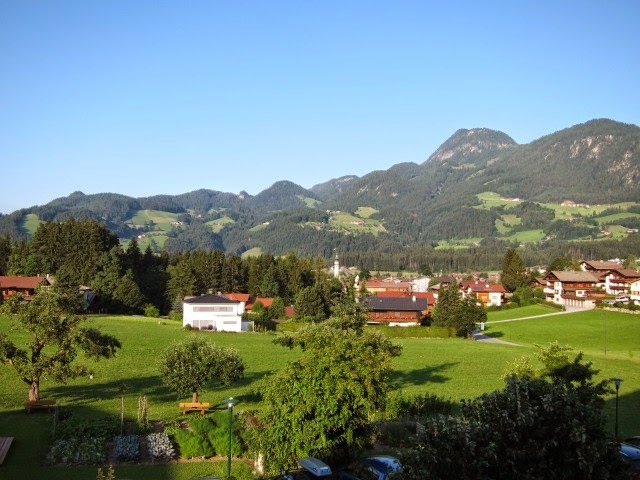 Most recently, we have stayed at the Hotel Pirchnerhof in nearby Reith im Alpbachtal. It's a lovely, relaxing place to stay, with a spa incorporating indoor and outdoor pools. Reith, pictured below, also has a gondola lift which runs in summer, saving the legs for high altitude climbs - with better views. Unfortunately, however, the new lift connection with the Wildschonau - a neighbouring valley which is some 45 minutes away by car - is as yet open only in the ski season. 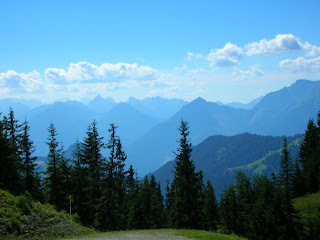 One walking itinerary which we couldn't resist repeating started from the Sonnwendjoch, a short drive away. It began with a peaceful ride on a single seat chairlift, over 40 years old, took us over as ridge to a jewel of a mountain lake in which, if you're used to bathing off British beaches, you may freshen up with a quick swim before picnicking, and continued though a stunning beautiful valley. Finally we completed the circuit with a switchback dash back to the lift, to ride it down tho the car park before it closed for the night. How: Munich is the most convenient airport. The drive to Alpbach by rental car takes around 1hr 30mins. 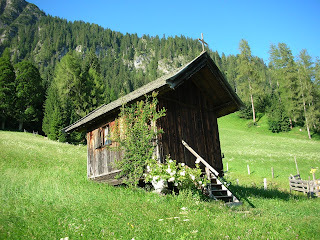 Plenty of sites list self catering accommodation but you could start with www.alpbachtal.com. Don't miss out on the chance to see the lovely nearby town of Rattenberg. One word of advice. In June there was a plague of horse flies on the lower slopes. There seemed to be no way to deter them. Sometimes they drew blood. The only consolation was that their bites did not itch for more than a half hour or so. Unlike those infamous Scottish midges. But best cover up with light clothing as far as possible. 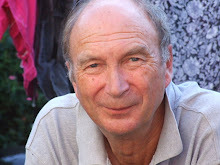 (This article is an updated version of one which first appeared in 2007).